" The Agricultural Product Standards Act, 1990 (Act No.119 of 1990) provides for the Minister only to make regulations, and the Executive Officer therefore does not have the powers to amend the promulgated regulations by means of a dispensation." I have been saying this for a long period of time and felt like a lonely voice in the wilderness because in my opinion the powers vested in the Executive Officer to grant a dispensation are set out in Section 16 of the APS Act and Section 16(3) deals with the discretionary power to relax any requirement under the Act or a Regulation. A discretionary power such as this cannot extend to extending the requirements of the Act or Regulations or making a quasi amendment to a Regulation in the guise of a dispensation as only the Minister is vested with the powers to promulgate or amend Regulations. 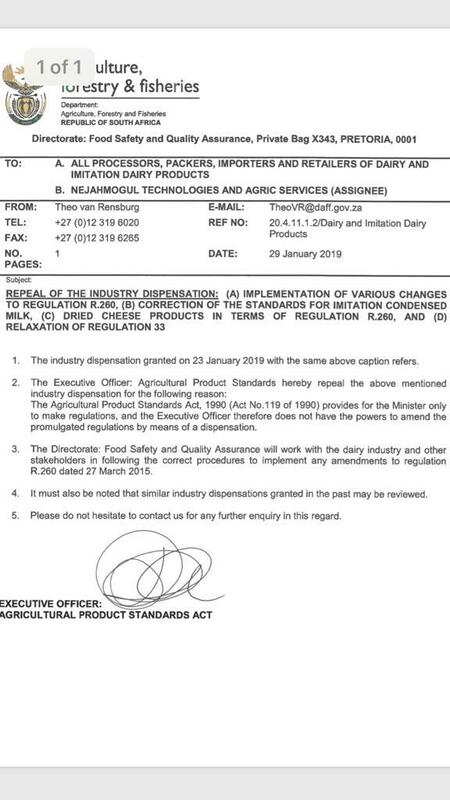 Industry wide dispensations are an indication of a problem (practical or simply an error) with a Regulation and as such should be dealt with by way of amendment of the Regulation by the Minister, after consulting all interested parties by way of public notice and an invitation to comment. The rescindment of this industry wide dispensation and the indication that others will follow does not mean that individual dispensations for specific reasons may not be granted by the Executive Officer and, to the contrary, the clear intention of Section 16 is just that and good cause must be provided by the applicant as to why a dispensation would be required and the Executive Officer needs to balance the risks of harm to consumers and the rights of consumers against the potential economic harm to a producer or retailer when granting or rejecting an application for a dispensation. Any such decision may be appealed in terms of Section 10 of the APS Act and eventually be reviewed by the High Court if the matter escalates. However, readers must be reminded that applying for a dispensation is an admission of wrongdoing and that the form used to apply for a dispensation makes this clear. Once a dispensation has been applied for, whether granted or not, it will be very difficult to then argue that there was compliance prior to the dispensation application. If a dispensation is granted the terms thereof must be strictly complied with including the time periods stated therein. For advice on compliance and other legal issues in the food industry contact Janusz Luterek at janusz@hahnlaw.co.za - your food lawyer."